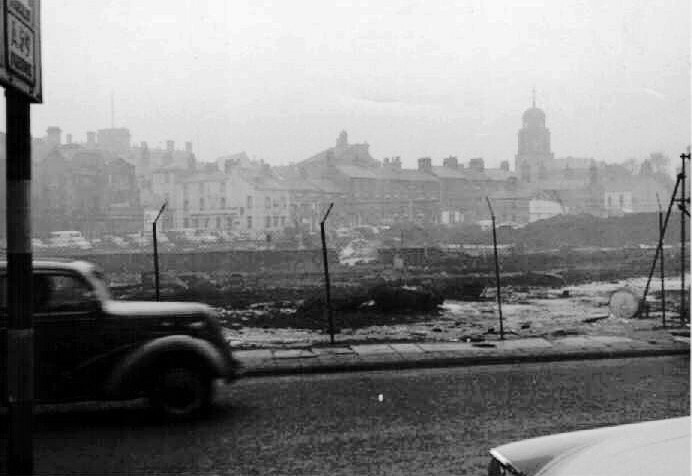 A couple of photos taken by Terry Lavelle in the early 1960's just prior to the building of the new market hall(s). Terry's photos were taken from Starkie Street, which is just off the bottom of Penny Street, where The Fleece pub is situated (see lower photo). The Victorian properties on the other side of Penny Street and the streets just beyond it, had only recently been demolished, allowing a clear view of Ainsworth Street in the distance. 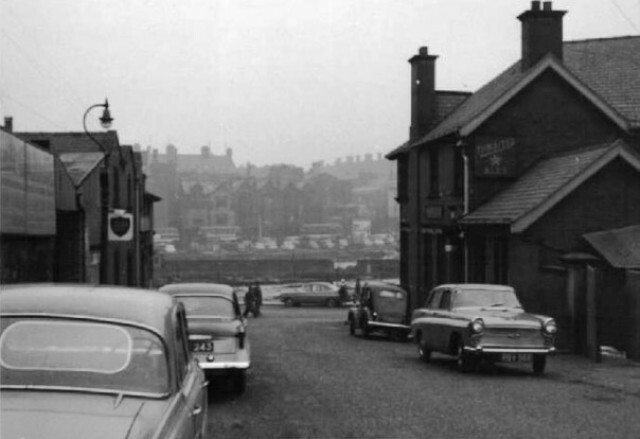 The Haymarket pub (the light coloured building) on the corner of Cort Street and the dome of St John's Church can easily be picked out in the upper shot. These photos would have been taken sometime in 1963, as the market hall would have been nearing completion by the autumn of 1964. It's interesting because, in the not too distant future, the 1960's market halls are going to be demolished and Ainsworth Street will again be visible from this same spot, although this time, the shopping precinct / Mall will be prominent in the distance, as The Haymarket and the other properties along Ainsworth Street also disappeared in a later phase of the 1960's redevelopment of the town centre. Progress and the ever changing landscape of our town ? 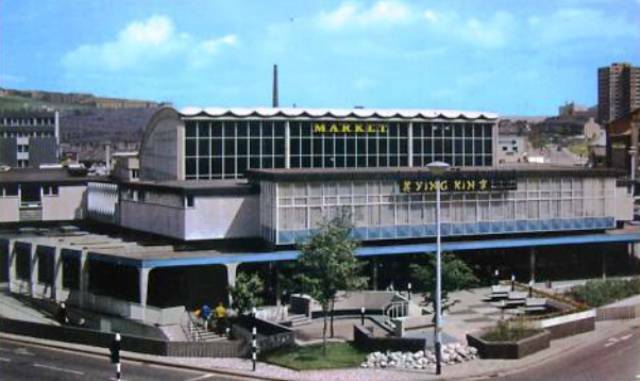 Below is a 1970 postcard image of the market hall that was built on the above plot of land, though photographed from a different angle (Penny Street runs up to the right, towards Larkhill, in the postcard photograph). I've been trying to place what the building with the pitched roof and some sort of Dome on top is between St John's Church and the Old Town Hall. It seems to be in the Richmond Hill and Tontine St area. I don't know John. It is in that general direction. Just had a quick look at it again. It looks too close to be in that area to me. It looks like it is on Victoria St (maybe the rear of a property). You could be right Colin. I really should remember what that building was, seeing as I lived no more than 1/4 mile away from it. I've had a look at the 1910 map and all I can come up with are the Municipal Offices just higher up towards Richmond Terrace than the Courts Building on Victoria St.
And guess what ? I don't even remember that building !!! Hi I was wondering if you had a picture of the plaque the queen(?) unveiled in 1964 when the new market was opened. My grandfather was the borough engineer at the time, Mr. Frank V Powell. The family have heard that the market is to be demolished and would like to know what will happen to the plaque. Look forward to hearing from you. Hi Claire, sorry I don't have any photos of that plaque. Have you tried looking on the Cottontown website, there could be something on there. As to what will happen to it, I couldn't really tell you. Perhaps you could somehow find out who owns the complex (maybe via Blackburn Council) and then see what they have to say and maybe who they sell the site to. I've read that Sainsbury's are to build on there, but whether that has been finalised, I wouldn't like to say. If you contact Blackburn with Darwen Borough Council, I think Dave Harling is the councillor involved with regeneration, so he might be able to provide you with some insight. how would you contact someone you knew in blackburn in 1963 i lived in ice st kevin. Heck Kevin, that's some question. I've sometimes seen people send little notes to the Lancashire Telegraph letters page, asking if anyone knows the whereabouts of so and so. Sometimes the LT follow it up and say that someone came forward, or contacted the person who was looking for them via e-mail or whatever. Other than that mate, I wouldn't really know. If you have the full name of the person you are looking for and their address back in 1963, you could look through the electoral rolls in the library. But obviously the person would only be in those, if they were of voting age back then. If you did manage to find them on the elcetoral roll, you could then see the rolls for the following years to see how long they stayed at that address. There's a way of doing it online too, via the BMD's (Births Marriages & Death registers), but that can be costly and can also be complicated. The first option, writing to the LT might be your best bet. Finally, you could join some of the Blackburn groups on Facebook and put out an appeal on those. You would be surprised how many old friends and work colleagues are reunited on those. I hope that's some help. Good Luck !